Idaho Attorney General Lawrence Wasden discusses the Idaho Public Records Law with a super-engaged crowd in Hailey on Monday evening. 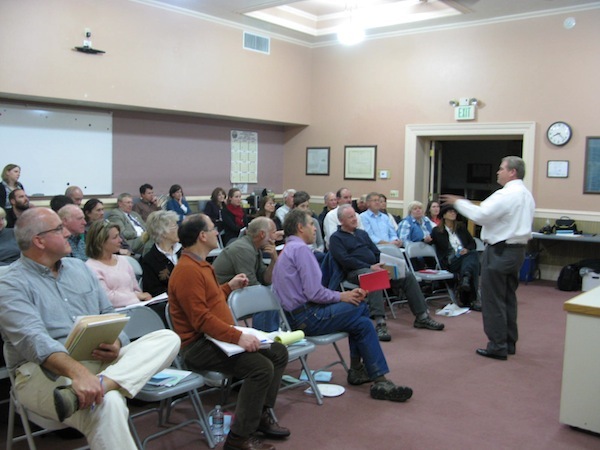 HAILEY, Idaho – A super-engaged crowd of 45 gathered in the Old Courthouse in Hailey on Monday evening, Oct. 14, 2013, to learn about Idaho’s open meetings and public records law, and those attending – government officials and staffers, reporters from the news media, and interested citizens – had plenty of questions. By the time they left, the crowd gave the session top reviews, saying they’d learned plenty. Plus, each attendee left with numerous handouts, including the Idaho Attorney General’s handy Open Meeting Law Manual and Idaho Public Records Law Manual. The Hailey session, co-sponsored by IDOG and the Idaho Mountain Express, featured a hearty buffet provided by the Mountain Express to help everyone through the evening. It was the first of four open government seminars planned this week in southern and eastern Idaho, featuring Idaho Attorney General Lawrence Wasden, Chief Deputy Attorney General Brian Kane, and IDOG President Betsy Russell. Tuesday night, the sessions come to Twin Falls; Wednesday, Fort Hall; and Thursday, Rexburg. In reviews of the session, the Hailey crowd was highly impressed – and not just with the food (but that, too). “I refined what I already know,” wrote a local prosecuting attorney. “I learned that the public is owed openness and information,” wrote an elected school board trustee.